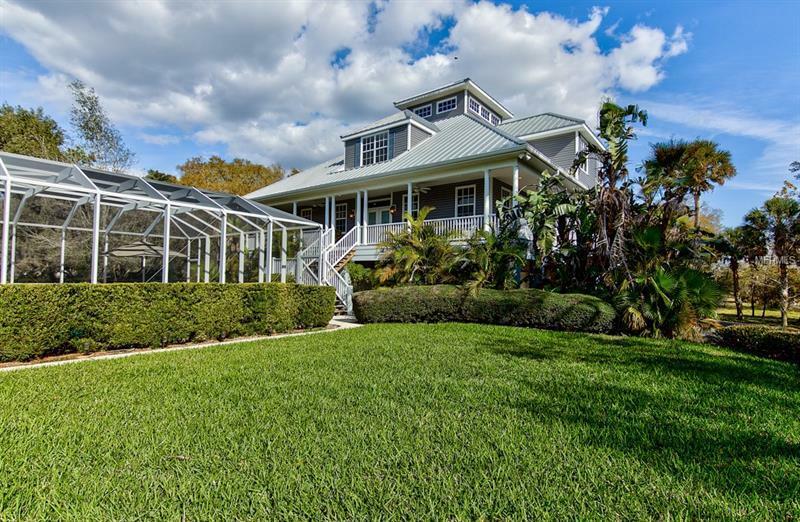 You will find ample peace in this meticulously maintained custom Key-West style home on 5+ wooded acres. All tucked away from the hustle and bustle in the private airport community of Hidden River. This steadfast 4761 sqft home features timeless upgrades such as granite counters stainless appliances soaring ceilings German ceramic window film (cuts electric bill by over 40%) private elevator wood cabinets w/under lighting salt water swimming pool + spa crown molding whole home ventilation fan & so much more! All floors can be accessed via the stairway or private elevator. This is a split level 3-story home w/ the master bedroom on the 2nd level guest bedrooms upstairs & storage rooms + air conditioned workshop on the 1st floor. The main floor offers a foyer entry formals kitchen family room 1 Â½ bathrooms master suite office & indoor utility. The 2nd floor is opened to the main floor & features a loft 2 bathrooms & 3 spacious bedrooms. Some premium features include 5â baseboards french doors transom windows above all doors (great for natural light) plantation shutters travertine tile floors 2 electric fireplaces induction cooking stove top & home generator. Enjoy those beautiful Florida sunsets from your storybook wrap around deck. In addition to all its craftsman charm this home also offers ample growing room w/ an attached oversized 4+ car wrap around garage w/ additional parking spaces & more space for all your maintenance equipment. Schedule your private showing today!